We have live support available during our business hours which are 9:00 am to 5:00 pm cst. Monday through Friday. Please enter your name, store name and the question you have below. Click the "Click Here" button and we will be happy to answer any of your questions. Enter your question in the box below and click the "Click Here" button to proceed. Click on the drop down menu to find help on the topic of your choice. Click "Watch Video" to watch the help video for each topic. The help videos will walk you though step by step directions for each topic you are interested in learning about. Enter an Item into the sales grid by either scanning the item in or pressing the home key while the Enter SKU Here text is selected. Select the discount price in the sales grid by either clicking on the disc. price or by moving right with the arrow keys. Press the home key or double click the disc. price. Select the discount that you want to give on the item and press the enter key. The selected item now has its own discounted value. To remove the discount simply click on the gray x on the Line Discount box at the bottom of the screen. Enter Items into the sales grid by either scanning the item in or pressing the home key while the Enter SKU Here text is selected. 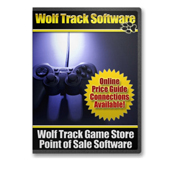 Double click on the blue discount on the bottom right side of the Wolf Track Software window. Select the discount that you would like to have apply to the entire ticket and press the enter key. To remove the discount simply click on the gray x on the Ticket Discount box at the bottom of the screen. If you want to create a series of taxes, select the Add Tax button on the top of the screen. 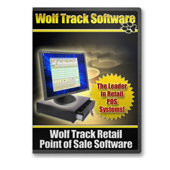 Wolf Track Point of Sale Software makes it easy to take credit cards. You must have one of our compatible credit card partners setup to take credit card payments. Now you are ready for the next customer in line. Select the Gift Card SKU you wish to sell. Enter the selling value if you have it set up at $0.00 price. Complete the transaction as a normal transaction. Swipe the Gift Card when prompted. You will receive a confirmation printout with the new Value. Select Return from the Type Menu. 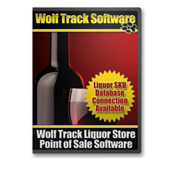 Wolf Track Software provides help and support that is second to none. Durring a support call we may ask to help by viewing your screen or by showing you some of the unique features of Wolf Track. If you are provided with a Remote Access Code please enter it below along with your name and click the 'Click Here' button.